Today was Arsenal Members’ Day. 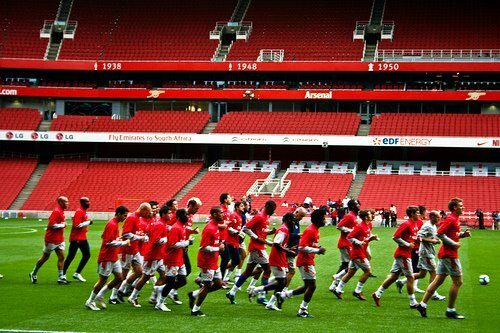 A select group of fans were able to come to Emirates Stadium to watch the team train and participate in some amusing games and activities. While I obviously wasn’t able to attend, there are some nice pictures floating around the Internet and it seems like a good time was had by all. What I found most hilarious about the photos that I’ve seen so far is that Emmanuel Eboue looks as though he can’t contain his joy and enthusiasm. It’s almost a little frightening. Another interesting tidbit is that Phillipe Senderos was also in attendence at today’s event. While there are still plenty of stories indicating that he will go to Everton, the speculation that it was a “done deal” might have been premature. If Everton refuse to sell Lescott to Citeh, it’s not likely that they will be in the market for Senderos, so this is a story that will probably drag on a little longer. One deal that was pronounced dead today was Arsenal’s attempt to sign Marouane Chamakh. Arsene Wenger plainly said that the deal is “over” because a transfer fee could not be agreed. Wenger’s aggravation was evident by his observation that Arsenal could simply acquire Chamakh for free next season after his contract expires. Chamakh himself has gone so far as to hint that he would not give 100% to the Bordeaux cause this season because he would feel “betrayed” by the club preventing him from completing a move to Arsenal. While Chamakh is a player that Arsene would like to sign, he is clearly not the top priority for the club. He certainly is not a player that Wenger will overpay to acquire. But that doesn’t mean that this transfer saga is truly concluded. If you remember, we had a similar experience in January as we awaited word on Arshavin’s arrival. The club drove a hard bargain and, ultimately, Zenit were forced to acquiesce. It would appear to me that Arsene is merely drawing a line in the sand once again. He is, in effect, saying to Bordeaux that their current demands will not be met and that we are more than willing to walk away from the negotiating table. Considering the statements by the player and the fact that he will be available for free next summer, the prospects of losing out on this deal will not excite Bordeaux. I still think it is more than likely that Chamakh will arrive at Arsenal before the window closes. And if it happens, it will be another example of diligent negotiating by Arsenal. While the speculation swirls around Chamakh and Senderson, the rumor du jour continues to be about Salomon Kalou. I won’t devote much time to this topic because I discussed it at length in yesterday’s post. Suffice it to say that the reaction of Arsenal fans to this rumor is wildly premature. Some fans are using it as an opportunity to question Arsene’s judgment even before there’s any indication that Kalou is a genuine target. Considering the amount of baseless drivel produced by the media this time of year, it’s odd to me that this is the one rumor that some supporters have chosen to sink their teeth into. Kalou might be a great addition to the squad or he could be the last thing we need. Until there’s some substantiation, I don’t see the point in wasting time arguing about the merits of the move. So now for the big news: Cesc Fabregas is transferring to AC Milan. At least, that’s a disctinct possibility if you believe anything you read in The Sun. Fortunately, I don’t, so I’m not the least bit concerned. Obviously this is a preposterous story written by a very desperate journalist. But what makes the story so hilarious, is that the headline is monstrous but the article itself is actually focused on the state of the Chamakh deal. There’s about three sentences devoted to some nonsense about Berlusconi lining up a bid for Cesc (unacompanied by any quotes of course) and then the article moves on to some news that based on reality. At this point, I’m convinced that the tabloids have a “random transfer headline generator.” There’s really no other way to explain it. And that’s about all that’s happening at the moment. In the next day or two, we can have some fun anlyzing the upcoming Champions League playoff draw. The third qualifying round is nearly complete and that will give us an idea of who we would like to face, and who we’re hoping to avoid. If you get a chance to go to the official Arsenal website, there are some nice pictures of members’ day that will fill you with warm and fuzzy feelings about the state of the club and the comraderie in the dressing room. Hopefully those feelings will be the same in May.